Another clinching game for the Royals, but this one was probably the most unexpected of all. The Royals were coming off a disappointing 1983, which saw them finish a full season with a below .500 record (79-83) for the first time since 1974. Not only that, a drug scandal had rattled the organization in the off-season resulting in a suspension for Willie Wilson that kept him on the sidelines through May 15. Plus George Brett struggled with injuries going on the disabled list three times and playing in only 104 games. Yet on Friday, September 28 at the Oakland-Alameda County Coliseum the Royals were closing in on their fifth American League Western Division title in nine years. 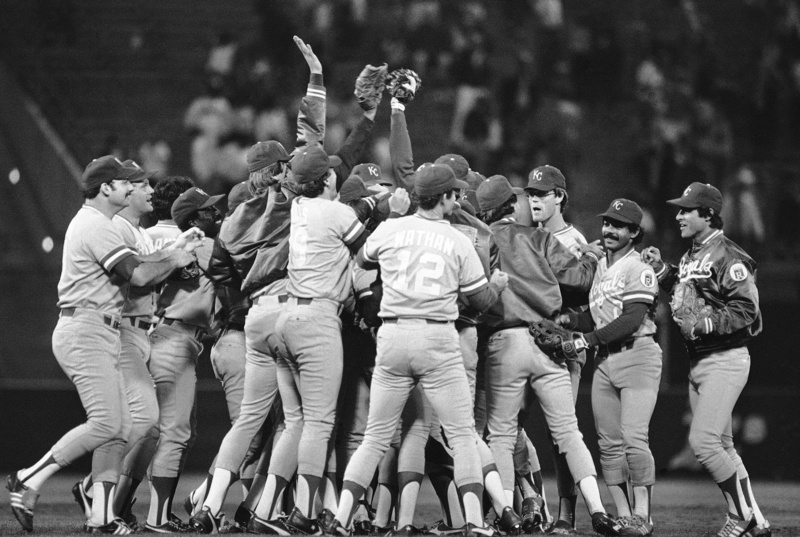 Many familiar names played key parts in that game including HRs by George Brett and Frank White with Dan Quisenberry getting the save after Willie Wilson captured a fly ball off the bat of Rickey Henderson to close out a 6-5 clinching win. Just A Bit More: There were also several new names on the scene in 1984 that helped the Royals get back into the playoffs for the first time since 1981. Charlie Leibrandt was the winning pitcher in that division clinching game and is often overlooked among the Royals fresh faces that year. Charlie came to Kansas City in a trade with the Cincinnati Reds on June 7, 1983 for LHP Bob Tufts, but didn’t make his Royals debut until almost a year later on June 1, 1984 at the Metrodome against the Twins. He soon became a key member of a revamped Royals rotation that also included youngsters Danny Jackson, Mark Gubicza and Bret Saberhagen. Seemingly out of nowhere Leibrandt would win 11 games for the 1984 Royals – his first of five consecutive seasons posting double figures in the win column in Kansas City. Yes. That is Bucky Dent on the right side of the picture above. He played eleven games for the Royals down the stretch in 1984 – the final games of his 12-year major league career.